80 minutes in to the game and I had this review finished in my mind: excellent passing, controlled the game, two well executed goals and us hitting double figures in points. Come the end of the game I was just tempted to leave a string of expletives in large text as my review. Halving calmed down I guess the mood is more of bewilderment rather than anger as the performance, especially in the first half was superb. 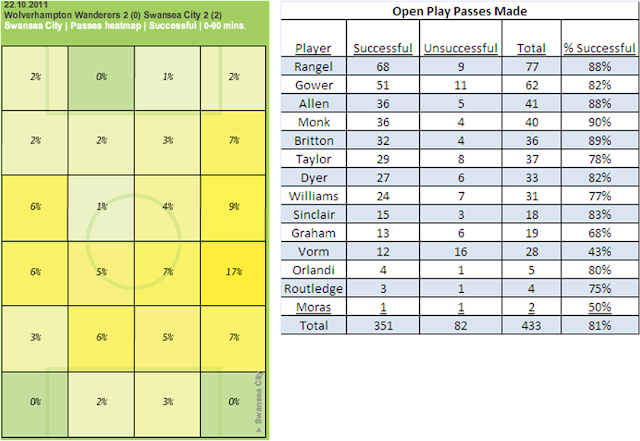 Looking at the passing stats, the actual number of passes from Swansea was relatively low (433 Open Play passes compared with 595 the previous week against Norwich, with an 81% success rate compared with 89% against Norwich). Where you could argue there was a lot of passing going nowhere last week against Norwich, Wolves (lack of) defence meant far less probing was needed to find openings and we could afford to be more direct. The noticeable thing about the passing is how much came from Rangel and Gower which can be seen in the overall passing stats and the passing areas being heavily down the right hand side (often involving Dyer). It'd be over-simplifying things to say that Dyer does the hard work and Sinclair gets the glory, but generally most of the ball goes down Dyer's side on the right which as well as posing its own threat leaves space on the other side for Sinclair to attack. Whilst a lot the wider media may focus on Sinclair given his goals last season, within the Swan's fanbase there's a real appreciation for the shift Dyer puts in on a consistent basis. For Gower, as good as his performance was, his corners were pretty tame affairs that were gentle chips in rather than having any real menace. Swansea had 11 corners of which 3 were classed as Successful (27%) compared with 5 of Wolves' 8 (63%). Swansea had 17 shots in total, the second highest they've achieved (18 against Sunderland being the highest) and way more than the season average so far of 11.4. They still however had less shots than Wolves who had 22. Looking at when the shots were taken shows the change that took place in the last 10-15 minutes. I've cut the second half at the point Britton's went off but that's not meant to stick the boot into Orlandi who replaced him, as the stats would be pretty much the same if I cut it after 83 minutes when Dyer went off as only 1 shot was conceded between these points. In a later blog this week I'll look in more detail at trying to pinpoint where the change really occurred. There is a definite difference in the stats between the first and second half (e.g., Rangel made 49 successful open play passes in the first half compared to 19 in the second) and I'll try to uncover whether it was Wolves' double substitution, the substitution of Britton or just bad luck (or bad defending) that caused that finish.